Ravi Teja has a dedicated fan following and I’ve read good things about his films so I decided it was about time I watched one of his movies. I bought this film on my last trip to Chennai on the recommendation of a friend, and since the blurb on the DVD suggested it would be more of a thriller than the typical mass masala fare it sounded more to my taste than some of the comedic roles he has played. And I did enjoy it, well mostly, at least up until the last 30 minutes anyway. Ravi Teja plays an advertising agent Sekhar, although a look at his pitch for Rupa underwear suggests that perhaps it’s not his true calling. He’s happily married to another advertising agent in his office, Madhurima (Jyothika). She has to take a back seat to her more ebullient husband who is clearly the office favourite. Brahmi makes a brief and understated appearance as Sekhar’s boss but for a change there isn’t much comedy in his role. There is some humour in these scenes but it mainly arises from situations with Sekhar and his wife and generally is well placed and actually quite funny. The relationship between Sekhar and Madhurima is convincingly portrayed and they seem to have a strong and loving partnership. I could do with less of Ravi Teja’s back hair on view to demonstrate this, but other than that I think writer/director Harish Shankar is accurate in his portrayal of a working couple.They live in a block of flats where the lift never functions and there are constant disruptions from the neighbours and their children. When Madhurima becomes pregnant, they decide to relocate and quickly find a recently vacated house. However just as they move in, two men burst through the door and shoot Sekhar. He wakes up handcuffed to the bed in hospital and is immediately interrogated about his terrorist connections. He learns he has been mistaken for a Maoist by two encounter specialist police officers, Nagesh and Divaker. Although the pair realise their mistake almost immediately, they decide not to take responsibility for what has happened and instead salt Sekhar’s house with evidence to make sure that their error is not discovered. In the meantime Madhurima protests Sekhar’s arrest and manages to hire a lawyer. By the time of the trial however, the lawyer has been paid off by the two cops and has convinced Sekhar to plead guilty, telling him he will get a short sentence and that will be the end of it. Of course this is not the case and Sekhar is sentenced to 8 years in jail. Madhurima immediately vows to get him released and is aided by Geeta, a journalist interested in the case. There are various moments of drama in the prison: Sekhar is fortuitously sharing a cell with an inmate Tilak who has certain rights and privileges with the guards but he is also menaced by the self styled boss of the jail, Syed. This is all conveyed without recourse to cliché, or over the top drama and serves to give an idea of Sekhar’s true character as well as set up subsequent events in the jail. Madhu’s struggles are also convincingly portrayed. Geeta doesn’t take over the defence or engage in unrealistic methods to help Madhurima find justice, but instead advises her of which organisations to contact. This is all very plausible and fills out the background of the story well. But just when you think this is going to be a battle played out in the courts and among informers in the back streets, there is more drama as Madhurima is threatened and Sekhar escapes from jail. Up until this point the film is very good; a slightly different story, well paced and told with good performances from the cast. But from here the film starts to rely on violence and bloodshed and the storyline becomes more predictable and clichéd as Sekhar plans his revenge. There are some unpleasant torture scenes and the realism that was built up so very well in the first half of the film is lost as Sekhar suddenly becomes able to fight his way out of any situation. However there is still a very ‘Hollywood’ feel to the action, and the slickness of the production carries through right to the rather unsatisfactory end. There seems to be an obsession in the Telugu film industry with making sure there is a happy ending (of sorts at any rate), and in this case I would have preferred to see something more in the way of consequences for everyone’s actions. Despite the collapse of the plot in the second half, the film sets up the basic story well and the leads are all excellent in their roles. 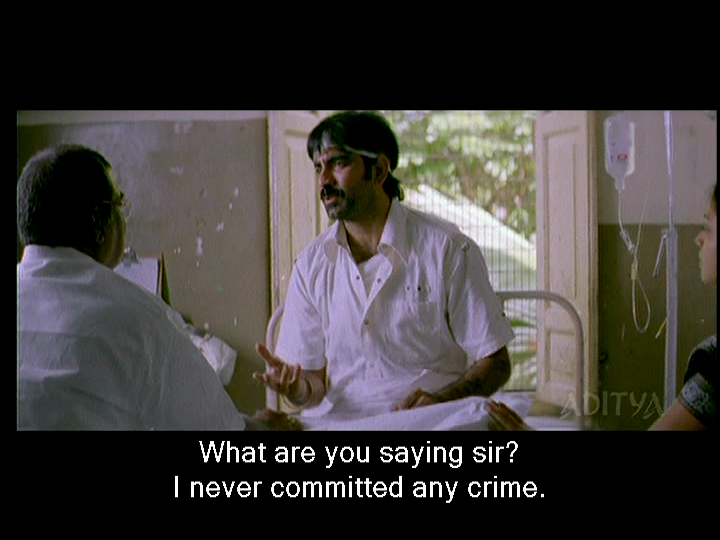 Sekhar’s confusion and distress at the situation he finds himself in is well portrayed by Ravi Teja. I was very impressed by the vulnerability he was able to convey as the injured and baffled victim in hospital and then as the somewhat shell-shocked and stunned prisoner in jail. He was even reasonably convincing in the action roles up until he had to take on a number of much more muscled and bigger extras. I know he is the hero but there is a limit to what I can believe! Jyothika has a much more developed role than is usual for the heroine in Telugu films and I really thought she was excellent as Madhurima. Her relationship with her husband is very realistically drawn and the romance is sweet without being cloying. Her distress at her husband’s situation is perfectly depicted as is the change in her character as she first breaks down and then becomes a driven and determined woman out to get justice for her husband. The only scenes which didn’t fit were when the story of the couple’s initial meeting was shown as a flashback scene later in the film. This felt misplaced and disrupted the story just when it really needed to be tighter. Although it does mean we get another good song from Ajay-Atul. Although this is out of place in the film it is nicely pictured – I cannot explain the gloves in the opening shots though! Apart from the two main leads there are a number of the usual suspects in the film who all play their roles with their usual competence. 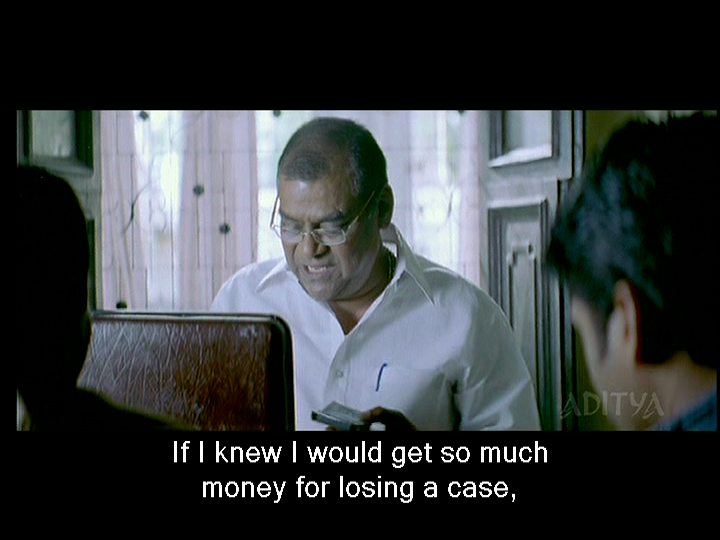 Kota Srinivasa Rao is a perfect fit as the corrupt lawyer and both Subbaraju and Ravi Kale were fine as the deceitful cops. Raghu Babu shows up in a familiar role as a nasty warden in the jail along with Raja Ravindra as the useful Tilak. It’s a little surprising that the small role of Geeta is played by Tabu and it does seem a waste to have such a good actress only on screen for a few short scenes. But it’s always a pleasure to watch her even if it is only in a few scenes. There is some attempt at comedy in the second half with the CBI officer Surendra Kumar (Nagendra Babu) and his incompetent assistant Bapanna (Ram Jagan) but this falls very flat and thankfully the Harish Shankar seems to have realised it wasn’t appropriate fairly quickly. I would have found it this a much more interesting and appealing story if the film had dealt more with Madhurima’s fight for justice and Sekhar’s struggles in jail rather than going for the straight hero driven revenge drama. But then again that probably wouldn’t have been as popular at the box office. As it is, the second half of the film is a disappointment after the excellent build-up in the first half, and the attempt at a happy ending particularly jarring. I am favourably impressed with Ravi Teja though and Jyothika was fantastic. For those two excellent performances, and a good first half, this film gets 3 stars. This entry was posted in Tollywood and tagged Ajay-Atul, Brahmi!, Harish Shankar, Jyothika, Kota Srinivasa Rao, Nagendra Babu, Raghu Babu, Ram Jagan, Ravi Kale, Ravi Teja, Shock, Subbaraju, Tabu. Bookmark the permalink. Tidbit about this film.. RGV was planning to direct it in Tamil with Jo and Surya but had to back out due to the loss from the Telugu version. Thanks for the info 🙂 Jo and Surya – hm – at least the climax fights would have been a bit more believable with Surya at any rate! Such a shame they didn’t keep the same momentum up in the second half as I think then this would have been a really great film. So what are some of these other Ravi Teja films you mean? Since I’ve gotten my feet wet so to speak, I would watch more of his films. Just not keen on the comedy style but this kind of ‘action-drama’ would be good. embedded videos you posted are getting redirected to jpg files.not able to see them. This movie is pretty close to another movie “Sogasu Chooda Tharamaa” ( Director Gunashekar) with a difference that, Heroine fights till the end to get him rescued. May be it is a time to give Kick a try and blog about it? Thanks for letting me know. Not sure what the problem with the embedded videos was – maybe Temple has managed to fix it as they are working for me now? I wonder if the similarity to Sogasu Chooda Tharamaa was why they decided to go the way they did in the second half of the film? It’s such a shame as the first half is really good and keeping Madhu fighting until the end would have made the second half much better I’m sure. Who was in that film? Have you seen it and was it good? Hm – now that I’ve finally watched a Ravi Teja film I’m much more inclined to give Kick a try. Videos were not working only in this post.They are working fine now. if you don’t like his comedy then try mm mentioned movies “Amma Nanna O Tamil Ammayi” ,“Nenithe” ,“Naa Autograph” they don’t have that much comedy. I’ve updated my list of films to get and will include some of these for sure. Sorry I got the name wrong. It is “Manoharam” (Directed by Gunashekar) which is pretty close to Shock. Jagapati babu and Laya acted in it. The movie you mentioned is actually Manoharam.. which even won “Laya” a best actress award … The story line is similar but the way the heroine dealt the issue is different from whats shown in Shock..
Hi Dolce and Githa – Heather will be back next weekend. I’ve only seen Ravi Teja in Vikramarkadu and while I really liked the story and most of his acting, I kept thinking it could have better with someone else in the lead. He was good in the action and drama episodes, but the comedy wasn’t my cup of tea for the most, and the romance was not convincing or even appealing. Tolly – thanks for letting me know re the clips not working. I’ve checked a few other posts and it’s only this one that seems to have a problem. I will have a look and see if I can fix it. You are keen for us to watch Kick! I’ve always found Ravi Teja to be a good actor. Unfortunately he doesn’t have much charisma, in my opinion, though obviously his fans will disagree. 🙂 But I will see a film if he is in it, unless I feel it will be one of these blood soaked actionfests. I think another reason he may get short shrift, especially outside India, is that he is not good looking in a way that is appreciated by foreign fans. He is not, that is to say, in the Mahesh Babu mold. (But hey, if you can appreciate Pawan Kalyan, why not Ravi Teja? :)) I think this is one reason his romances may not be that appealing, especially if he’s paired with a very beautiful heroine. That said, I haven’t made a quest of seeking out his films. Just that whatever I’ve seen him in, I’ve liked him, and those formed the basis for my thinking he is a good actor. Some films that I would recommend are “Naa Autograph” (Telugu remake of the Malayalam film Autograph), “Avunu Valliddaru Ishtapaddaru”, (in which you may detect traces of a well-known American film :)), and the aforementioned Kick. I’ve had “Nenithe” sitting on my shelf for a while now, which I got because it’s supposed to be an inside look at how the Telugu film industry operates, but which I’ve put off watching because of it’s supposed violence quotient. Another film where I thought he did a good job was “Amma Nanna O Tamil Ammayi”, which also has Asin, Prakash Raj, and Jaya Sudha. However, I didn’t find the film itself all that great. It is directed by Puri Jagannath. Thanks for all the recommendations 🙂 I’ve seen the Tamil film Autograph but not any of the others. I have a huge number of films now on the ‘wanted’ list so I can forsee a lot of Telugu and Tamil film-watching this winter! I totally agree with your charisma comment. I don’t think Ravi Teja has the same appeal that some of the others actors have, and he’s not the most attractive man either. I’m one of those odd people who don’t find Mahesh Babu attractive (ducks for cover!) but I do think he’s a great actor and has bucketloads of charisma so I can understand his huge fan following. Ravi Teja really doesn’t have the same charm and strikes me as more of a ‘character actor’ rather than true hero material. I thought he was good in this type of action role, and must say that I think I prefer him in this rather than an out and out comedy and can’t really see him as a romantic hero either.